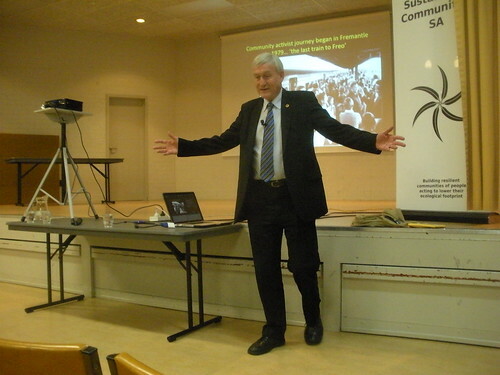 Our public meeting on the topic of Sustainability: what it can mean for people in communities was held on 18 April 2012 at Burnside Community Centre with guest speaker Professor Peter Newman from Curtin University. Professor Newman’s presentation focused on transport and car dependence and the impact this has on cities and energy use. He showed that this is changing with data now indicating that, after many decades of growth, car use has begun to decrease. Professor Newman’s stories of how change can be achieved gave us many useful examples of how we can continue our work to build a more sustainable community.